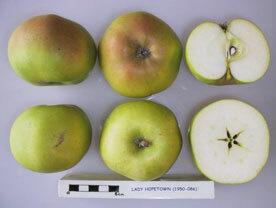 The Lady Hopetown dates from the National Fruit trials of 1950 from W Barnes of Bexhill-on-Sea. The fruit is greenish yellow with a crisp sharp fruity flavour. The fruit can be picked in mid October and stored until March and on to May if kept very cool.